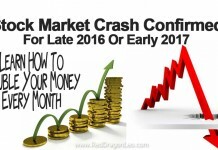 The year 2016 will be a year to remember when it comes to the stock market! Will it crash? I think so... it fact I think we could see the market drop well below the 2000 and 2007 prior tops on the SPX later this year. Why? Because of "clues" put out by the insiders as to the coming low. Naturally I don't know how to fully read their coded messages as I'm not one of the wolves but just a wise sheep. But they are clearly send out many clues to everyone with their eyes open. Last year when I told everyone that we'd likely crash on August 24th (2 months in advance) I did so based on many factors. 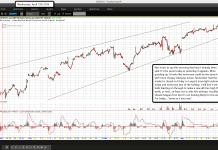 I first seen the technical setup in the charts that suggested we were topping out and should rollover in the fall of that year. Then I counted the wave structure to see what wave count we could be in. Now while I don't use trust Elliottwave only as a means to forecast the future, it did in this case match up with the technical analysis of the charts at the time. 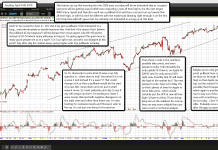 It also matched up with the historical patterns of late August being a weak period in the market. When calculating the wave structure it suggested that a Primary Wave 4 down would happen in late August, whereas the Primary 2 down happened around the same period in 2011. 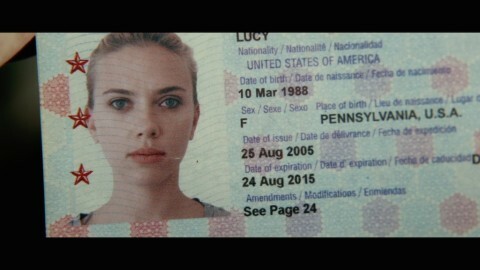 Then came the coded message... the "Lucy" movie with her passport showing August 24th, 2015 as the expiration date. The movie is similar in natural to another movie called "The Matrix", which again... tells us sheep that we living a world that isn't real. It's just a 3 dimension program where we take a physical form as a human body, but are true self is just an immortal spirit. I think the Bible tells the same message, but most people still don't it. The Matrix movie also had a passport in it, and it had September 11th, 2001 as the expiration date. 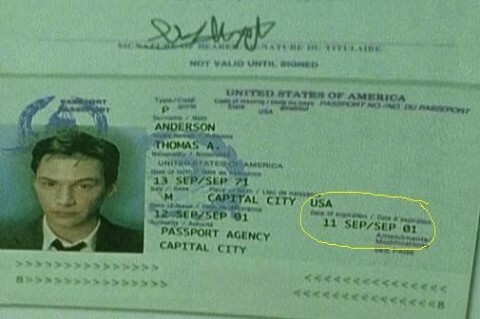 It was released on March 31st, 1999... which is 2 years, 5 months, and 11 days (895 days) before the 9/11 event happened (not including the 11th). That's 2 movies with dates on passports foretelling something bad happening on those dates. Coincidence? I think not. "They" have been telling us sheep for decades what they plan to do, and when it's scheduled to happen. It's coded of course and most of us don't see it in advance. It's coming out January 22nd, 2016 (which means it already out now as I'm doing this post). If I add 389 days to it I get February 14th, 2017. If I add 895 days to it I get July 5th, 2018. I'm sure there will be clues in the movie for all to see... but spotting them is sometimes hard. It might not be on a passport this next time around? But if it repeats the Lucy movie pattern we could see some important event on the 15th of February in 2017. Maybe that will be a bottom in the market the 666 low on March 9th, 2009 was? 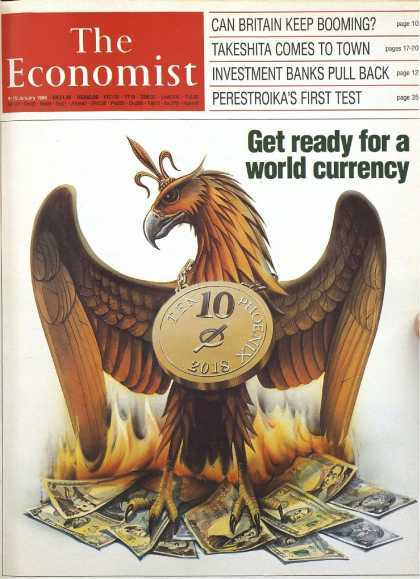 Or if it's more like the Matrix movie it could be a devaluation in the currency on July 6th, 2018 as suggested on this old cover of the Economist magazine from January 1988. It's it strange to see a coin with 2018 on it? 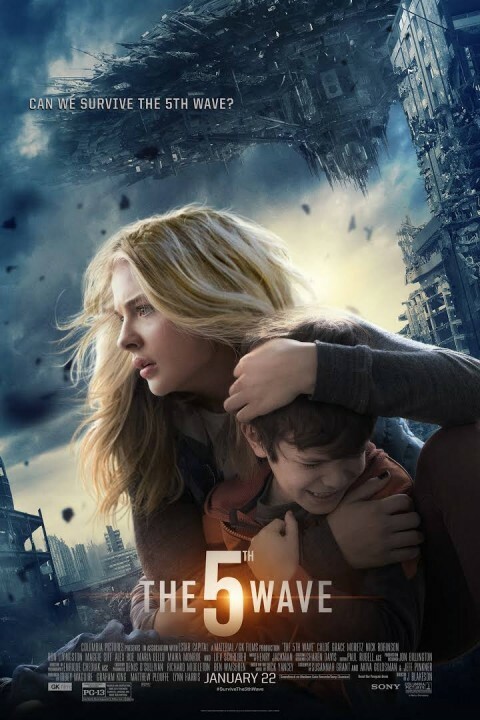 There will be clues in the movie called "The Fifth Wave" for sure... but I can't say for certain that I'll catch them. So I'll need your help as loyal readers of this blog to assist me in spotting them all. Just post a comment on this post if you see something valuable. Those time periods in days between each movie could mean nothing of course, as both movies weren't even close. So I don't expect any new movie to have any similar pattern either. 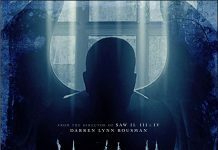 The only thing to note is that the time period between the release of the movie and the event foretold in the movie seems to be speeding up. So while the movie called "The Matrix" took 895 days the movie called "Lucy" took much less... only 389 days. Doing simple math it says that the Lucy movie was only 43.46% of the same time length of The Matrix movie. If you take 43.46% of 389 days you get 169 days... which would July 9th, 2016 using the January 22nd, 2016 release of the movie called "The Fifth Wave". Now that means nothing really as the coded messages are "in the movie" and I can't just do simple math to predict some future date based on one correlation between the two movies called The Matrix and Lucy. No, we have to look closely in the movie to see if they tell us any dates... and again, I'll need your help on that as I'm only one person. Sounds to me like a story about Jim Cramer as we all know how crooked that guys is. 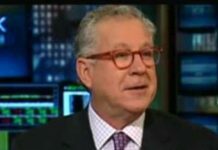 He's paid to lie to use sheep every day to get us to buy stocks at the top and to sell at the bottom as the insiders take the opposite side of our trade. I would miss that crook either if he was held hostage for real... LOL! 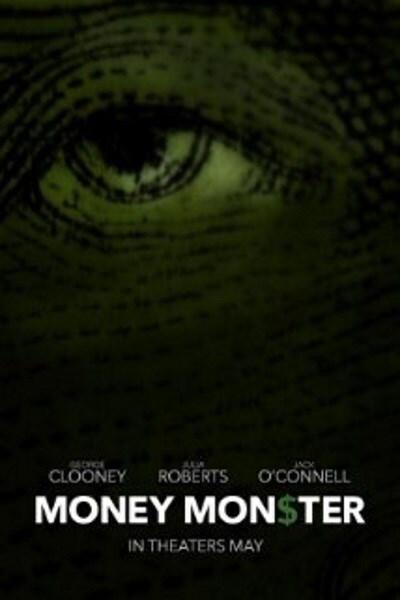 I find the old "one eye" an obvious message to the insiders that this movie will have coded information in it. I guess it's supposed to look like the eye on the dollar bill but I think it's also meant to portray reptilian aliens, as they all worship these demon creatures. Anyway, with the movie set to come out in May we could see a top in the market it that period if my calculations are correct? From a technical point of view, adding in wave counts, and historical data, a top should happen between late May and early June of this year. Short term though we could have already bottomed on January 20th, but only for a bounce I think as I do see another wave down to follow, and it should end in March. Then a 2-3 month rally into May/June before all hell breaks loose. 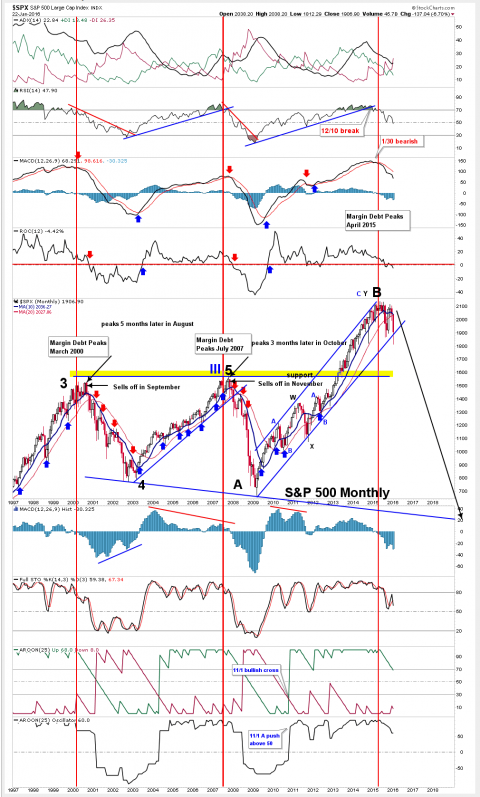 This monthly chart shows us how similar this pattern is when compared to the 2000 and 2007 tops and crashes. The 10 and 20 month MACD's for each period crossed and the market dropped for several months, then rallied back up to backtest the moving averages before rolling over again and crashing. This is why I think we'll see that May/June high, or backtest... and it's why I also don't think the January 20th bottom was all for this wave down. We should bounce some and go lower into March before the multi-month rally. Looking at that chart you can see that they are attempting to save the lower trendline from breaking on a closing bias for this month of January. They pierced it last week and came back above... but the month isn't over with yet. 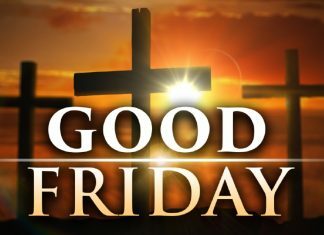 We still have one more week of trading yet to come. However, it's very possible that they still save the trendline in that rising channel as I don't see us breaking the January 20th low before the end of the month. You'll also see how the ROC (rate of change) is now negative (-4.42%) and went negative back in the 2000 and 2007 tops/crashes. Above that you see the RSI dipping below the 50 level, now sitting at 47.90 (that's the "Relative Strength Index), which isn't good for anyone thinking we are still in a bull market. Just looking at the angle of steep decline that the MACD's are falling from right now clearly says we are on our way to another crash soon. There nothing in this chart that I can point to that will support the bull market continuing. If you've been reading my blog for any period of time you should know by know that everything in this matrix (that we call "the world") is the opposite of the truth. It's all lies on the main stream media outlets as they constantly mislead the sheep into the slaughtering pin every day. Almost all of the larger, well promoted stories on the news are made up. There's no real school shooting as they tell you there was. There's no real beheading of Americans in the middle east. There's no real enemy over there that they call "The Taliban", "Al Qaeda" or "Isis"... it's all made up to control the sheep with FEAR (that's YOU and ME by the way). The stock market is no different. They have always controlled it and manipulated it to steal the money from the sheep. And they always schedule the massive rallies and the crashes to their benefit... both financially and politically. This is why we saw the past crashes happen around the exiting of one president and the election of a new one. 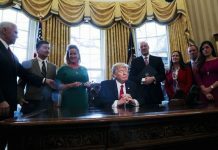 There are many articles about it on the internet to show the link between the presidential cycle and the stock market so you can do your own research there. I'll just tell you what I think. I see that when they have a president in for 8 years ( 2 terms) and it's near the end of his reign they tend to have a correction or a crash. 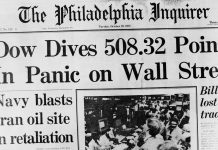 The 1987 stock market crash was one year before Reagan left office. The 2000 top and crash in 2001 and 2002 was when Clinton left after 8 years and Bush took over. Then again after another 8 years the market topped out in 2008 when Bush left and crashed with the new president in 2009. This cycle is common throughout history and while it's not always pointing to a crash after every 2 term president the odds go up huge when combined with other technical analysis, elliottwave patterns, and historical data all line up... which they ALL do right now! So here we are with another 2 term president (Obama) about ready to leave office and a stock market so overbought from artificial injections of stimulus that the odds of this time being different are about as good as them bring back 8-track tape players! Does this all look planned to you, or do you think it's just another coincidence that these crashes happen around presidential exit and entry periods? There are many other reasons to suggest that a crash is unavoidable no matter what... mean even if "they" decided to change their minds about the planned crash they have scheduled. What are they? Many things point to them not being able to stop this crash. There's the obvious fact that they can't get any other sucker (I mean country) to buy their Treasury Bonds, which they use to pay the interest on their debt. That ended over a year ago as the government started buying their own Bonds, which is like you running out of food and forced to eat our own fingers and toes. In the past we, as in, American, have been like Zombies eating other dead Zombies countries as they foolishly buy our worthless bonds and we use that food to keep from going bankrupt. But those days are over with now as there's no one left to buy our debt. We have run out of fingers and toes to eat and will soon starve to death. This is means there's nothing left for the Fed's to do to save this dying market even if they wanted too. It's over with... there's no more life support. 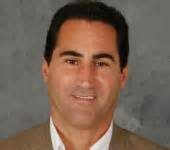 The fat pig of a market is on it's last breath now. Then there's the issue of the aging baby boomers that are downsizing to smaller places, meaning the real estate market is also going to take another hit as more and more of those larger homes coming into the marketplace. I guess on the bright side the smaller condo's and apartments could hold their value better as this older generation moves into them. Regardless, there's too many other factors that say that even if all those people kept their homes it still won't keep the real estate market up. There's simply not enough demand from the other generations to keep the prices of home up. The overbuilding of homes during the 2002-2007 real estate bubble is just too huge to be overcome, meaning there's still a ton of supply out there and little demand. 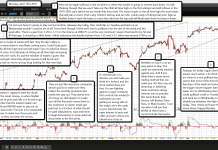 Harry Dent does an excellent job covering all of that on his site and the video's he's done. If you want to learn more go find him and watch his video's. I'll just keep it short as this post is long enough already... the market doesn't have a chance of "NOT Crashing"! 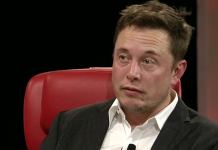 It's coming, and very likely it will happen later this year. 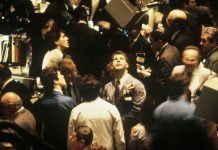 Do I know the coming stock market crash bottom? I have a clue... a FP (fake print) showing the likely "coming stock market crash target low" but I don't want to post it here on the blog publicly. However, I will share it with people privately. Here's the deal... 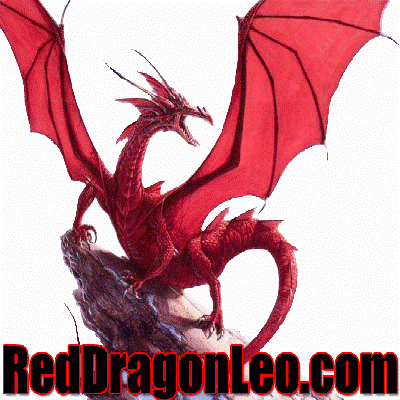 I'm starting a chatroom and want YOU, my loyal reader to join me in it. If you do, I'll show you the FP with the expected low. For now this chatroom will be completely FREE, and I'll keep it that way for awhile (maybe a month or so?) as a "thank you" for all the comments and emails you've done for me and this site. However, I will have too charge a fee for this room in the future. It does cost me money out of my pocket every month to run it. But, I'll give everyone in the room prior to it going paid a very special discount. It will be short lived of course but I'll make it cheap enough for everyone to afford. I'm not planning on charging for awhile now, but you still had better join as soon as possible so you'll be ready to get the discount when going to a paid room. Also note that I've put all of my favorite people's "Tweet's" and "Videos" on a new page called "Social Wall", which has one page that combines both of them and separate pages for just all their tweets and another just for all their videos. If you have a favorite person I you think I should include on either please let me know and I'll add them. Currently the monthly chart looks extremely bearish and ready to make the cross of the 10 and 20 month moving averages. When it does there's no doubt that the high for the market was previously put in. Right now it's "tentatively" put in last year with the May 2015 high, but it's not set in stone just yet. Considering how much damage has been done to this month of January already we can't rule out them saving that rising channel before the month ends, and then rallying in February, March, April and May. It's not looking good for them NOT breaking down again in at least one of those months to put in another lower low "intra-month" level outside of that lower rising trendline. So while I'm jumping ahead of myself and acting like it has already happened the facts are that the 10 month moving average is still above the 20 month moving average by about 11 points with the 10MA sitting at 2036.27 and the 20MA sitting at 2027.06 for the month of January. However, there's been a lot of damage done this month and even with a multi-month rally starting in February it's hard to believe they could stop them from crossing within the next several months. I won't rule it out complete of course as we've seen them pull rabbit after rabbit after rabbit of that hat that Ben Bernanke once wore before giving it to the next magician named Janet Yellen. Raise rates is the answer. They've stated that they plan on raising interest rates again, and some analysts think that the Fed's will raise them 3-4 times. Now I don't know who to believe on that as we really don't know what their plans are until they have there FOMC meetings and announce another rate hike. But everything they've hinted at so far DOESN'T suggest any more stimulus and DOES suggest more rate hikes. None that suggests anything bullish that would allow some new "all time" high to be put in again before they pop the bubble and crash it. Looking back at the 2000 and 2007 tops and crashes we see that in the 2000 bubble the market didn't crash until 2001 and 2002, which was early in the 2 terms that Bush was in. The election back then was November 2nd, 1999 and Clinton turned the presidency over to Bush in January of 2000. So it was in his first couple of years that we saw the stock market crash, but in the 2007 top the crash happened during the 2008 election year and bottomed of course on March 9th, 2009... which was the start of Obama as president. You can see that we do have a time window of 1-2 years for this to all unfold, but it extremely likely to happen either this year of 2016 or 2017 with the new president. Chartwise, it's looking very likely to happen in late 2016... but again, until I see that bearish cross on the monthly chart I can't rule out one more higher high. These people have been manipulating the stock market (and the world) for longer then you and I combined have been alive, so let's just play this one month at a time for forecasting the longer picture. Then one day at a time in the chatroom. Short term we appear to have a bottom in that should hold for awhile... like several weeks or even several months. The time window I have for this bottom to hold is from now until the first week of February. If they don't go back down within that period then we should rally up into March. So the bears still have about 2 weeks left to drop her hard again if they want another lower low. If not, we should have a nice rally into March before I see much danger of another drop. Considering that this market is predicted to be a crash equal to or bigger then the 1929 crash we have to think that every last ditch effort will be done to fool the most people before they let it collapse. So while I can do all the charting, wave counting I want... and add in all the historical data, it's still a RIGGED market! The only way to really know what's going to happen is to get the information directly from those that are controlled it and have the exact date of the crash already scheduled... which means the "Coded" messages in the movies might be the sheeps' only hope to figuring it all out. Watch every new movie you can and look for clues, then send them to me and/or post them in the comments of this post.